The legal principle of the ocean as part of the "common heritage of mankind" is partially anchored in the 1982 United Nations Convention on the Law of the Sea (UNCLOS) as it applies to the seabed and ocean floor located beyond limits of national jurisdiction ("the area"). The Convention on the Law of the Sea is the constitution of the ocean. It establishes a system of different ocean zones along with rules governing usage rights and obligations to protect and preserve them, and provides an institutional framework. 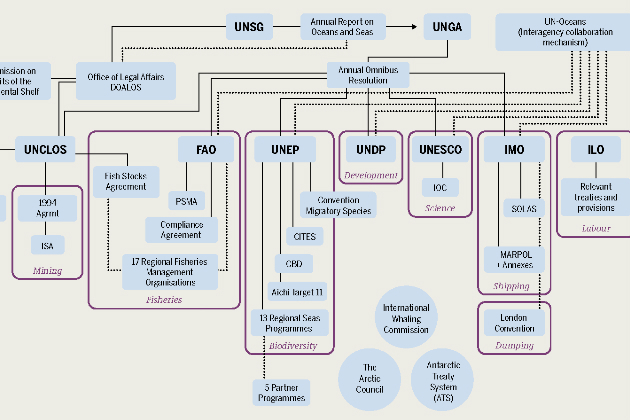 In addition to international organizations responsible for individual industries, like the International Maritime Organization for shipping or the International Seabed Authority for deep-sea mining, there are many regional ocean protection agreements and action plans involving more than 140 countries. Regions work together to prevent ocean pollution or to promote the protection of biodiversity through ocean protection zones. Regional fishery organizations and agreements attempt to ensure the sustainable exploitation of fisheries. And under the umbrella of the Convention for Biological Diversity it was agreed that 10 percent of the ocean’s surface area would become protected areas (science and environmental protection organizations recommend as much as 30 percent). Nevertheless, ocean governance, the system for the management and sustainable use of the ocean, is insufficient. The institutional frameworks, including diverse agreements regarding shipping, fishing, whaling, mining, and ocean protection, are fragmentary. There is too little international agreement, consensus, and cooperation. Furthermore, agreed-upon rules and goals are often not implemented, or not implemented effectively. For example, we are far from achieving the goal of designating 10 percent of the ocean as natural protection areas by 2020. There are too few sanctioning mechanisms for addressing failure to comply with agreements. 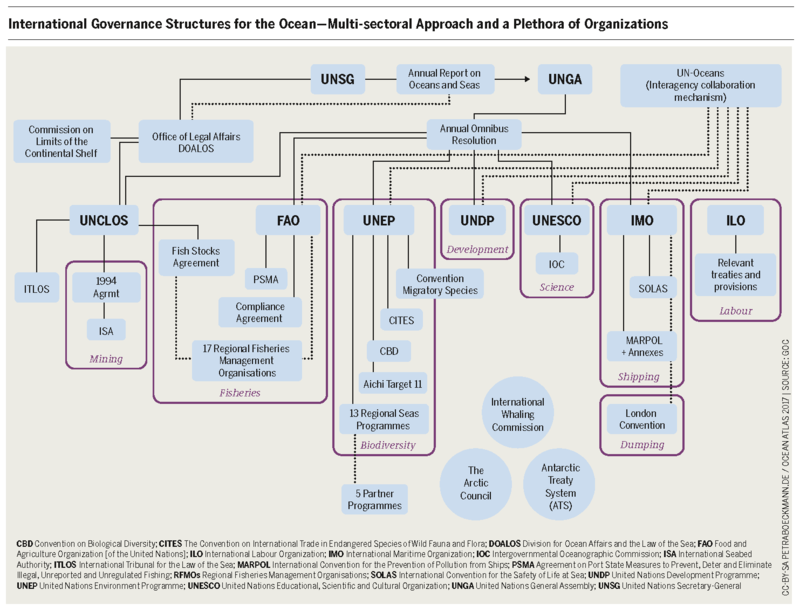 Comprehensive global strategies for integrated governance that measure up to the complexity of the oceanic ecosystem do not exist, even though the Convention on the Law of the Sea correctly emphasizes “the problems of ocean space are closely interrelated and need to be considered as a whole". Urgent change is needed if international governance of the ocean is to ensure that the world’s oceans and their resources are managed in a way that keeps them rich, productive, and safe for us and for future generations. A significant opportunity to adopt a more comprehensive approach to ocean protection is connected to the 2030 Agenda for Sustainable Development, which was ratified in 2015 by the United Nations. The protection and the sustainable development of the oceans, seas, and marine resources are addressed in their own goal, Sustainable Development Goal (SDG) 14. The seven sub-goals of SDG 14 are aimed at preventing ocean pollution, protecting the oceanic ecosystem, ending overfishing, and combating the effects of ocean acidification. Illegal, unreported, and unregulated (IUU) fishing should also be stopped. In addition to the subgoals of SDG 14, the cross-connections to other goals, like Dedcent Work and Economic Growth (SDG 8) or Responsible Consumption and Production (SDG 12) are important for protecting the ocean and its resources. Suggestions for and concrete steps toward achieving the goals of SDG 14 have not been enough so far. Analogous to the climate agreement, countries should report measures taken to reach SDG 14 to a centrally managed registry. This will produce transparency and long-term auditability. Additionally, inter-industry and regional cooperation on ocean and resource preservation issues must be strengthened. With all its subgoals and connections to the other SDGs, SDG 14 is an excellent point of departure for leaving the old “silos” and developing more coherent strategies for ocean protection. Regular reevaluations of the goals could strengthen this coherence and detect possible conflicts with other SDGs in order to promote integrated implementation. But the sustainability goals for the ocean still lack bite. There will be a first chance in June 2017 at the UN Ocean Conference, where participants are expected to agree upon concrete steps for implementing SDG 14. And in October 2017 the EU will hold the fourth “Our Ocean” conference in Malta, followed by Indonesia in 2018 and Norway in 2019. There is a lack of comprehensive frameworks for the protection and sustainable exploitation of biodiversity in those areas of the ocean that lie beyond the national jurisdictions. A new agreement that will be concluded under the umbrella of the UNCLOS would close regulatory gaps, for example, for the protection and fair management of marine genetic resources, as well as for improving the area-based management of ocean protection zones. An international country-level conference will initiate the negotiation process in 2018. Deep-sea mining presents an additional challenge for oceanic governance. Exploration is still ongoing and the deep-sea seabed and the deep sea itself have hardly been studied scientifically. The mining of resources in areas beyond national jurisdictions has not yet begun. The environmental risks posed by mining have been estimated to be very high. Global environmental regulations for deep-sea mining are currently being developed. This brings up a fundamental ethical question: should humanity begin risky deep-sea mining at all? There is no need for these resources at present. The deep sea should be protected, researched and administered for the common good as part of the shared heritage of humanity. A no to deep-sea mining would be a signal that we are finally serious about protecting the ocean. Our oceans must become the focus of effective, binding international agreements. The UN and EU are exploring new approaches. Implementing ambitious SDGs for the ocean can strengthen cooperation on ocean protection and support ideas for closing serious administrative gaps in ocean protection.